My mom brought me a kabocha pumpkin and cooked it with pork and that was unforgettably mouth watering. 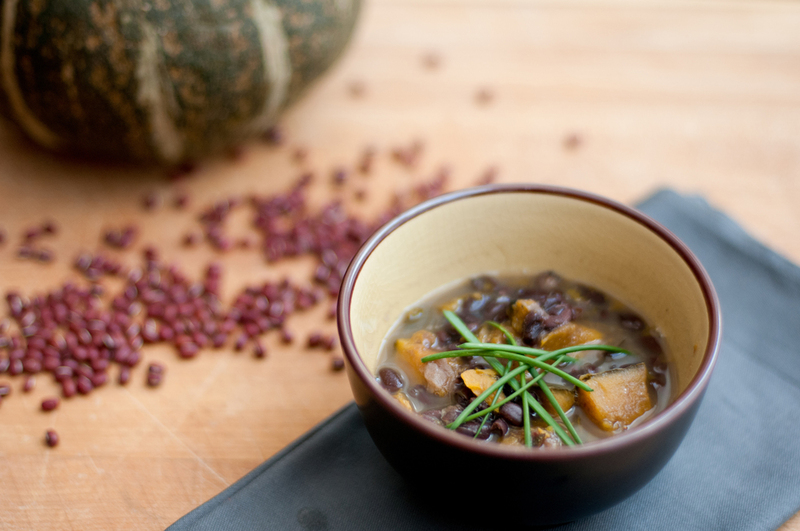 But, I wanted to craft vegan soups, so instead of pork I used a hearty vegetarian broth made from kombu and added azuki beans for protein. Azuki beans are sometimes listed as small red beans. The rind of kabocha can come in several different shades of green or orange. The ochre melon flesh inside is the same though. Soak the azuki beans overnight. Drain then set aside. Preheat the oven to 400F. In a pot, sweat the onions in canola. Give it a stir and put the lid on the pot to sweat the onions for a few minutes. Add the ginger, kombu and water. Bring it to a boil. Simmer for at least an hour then remove the kombu. Meanwhile, wash the kabocha, remove the seeds, and chop it up (leave the skin on). This takes a strong cleaver-like knife and no bashfulness about making slamming noises. Chop pieces smaller than 2"x2". Discard any rough and blemished parts. Put the pieces on a baking sheet and put it in the oven for 30 minutes. Add beans to the broth and simmer for 20 minutes. Add the kabocha to the soup and simmer for 15-25 minutes or until beans and kabocha are tender. Now it's time to add a salty flavor to the soup. Turn off heat. Whisk miso with 2 cups of broth to dissolve it more evenly into the broth. Add soy sauce and sesame oil to taste. You're almost done. Just remove the ginger when serving.